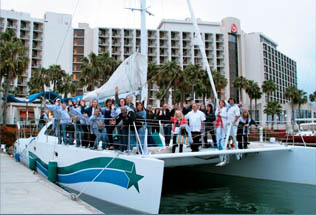 Get ready for another unforgettable afternoon of lunch, unlimited cocktails, and unmatched networking while on board the beautiful Aolani Catamaran. 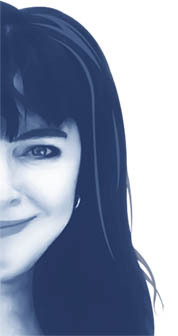 Going to the Traffic and Conversion seminar? After 3 days of action packed content and networking, here’s a chance to unwind and catch some rays before you go home. After all, you’ll want to make sure you have a least a little sunshine while you’re here. You will enjoy one-of-a-kind views of the Downtown skyline, the Coronado Bridge, and all of the military aircraft carriers along the Embarcadero. We might even stop for a quick dip in the water. 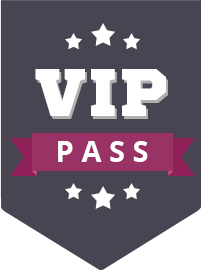 It’s everything you could want in a San Diego excursion plus the benefits of networking with awesome MeTribers. Designed by renowned catamaran designer Kurt Hughes in Seattle, WA, Aolani Catamaran is a 58′ Sunchaser American Catamaran. She was completed building in 2003. She is 58′ long with a 32′ beam. Sails are approx.. 1500 sq. ft. without spinnaker. US Coast Guard licensed for 48 people, plus crew. 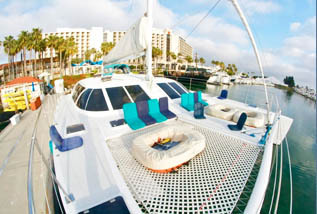 Certified to sail in the open ocean, most charter boats have to stay within the San Diego Bay. Catamarans are known for their stability! The two hulls are 32 feet apart, giving the base of the boat added stability and designed to slice through waves, rather than bouncing over them like most sailboats, therefor making the experience smooth, stable, and comfortable! An afternoon aboard the beautiful Aoloni Catamaran. connections that will last a lifetime. souvenir of our awesome time together. Please arrive 30 mins prior to our departure time of 12:00pm. The boat leaves at 12:00pm and we don’t want to miss you! 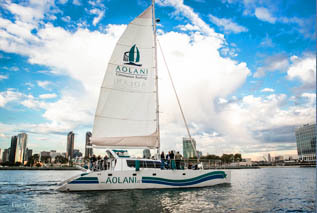 We’re having the Aolani Catamaran come to the San Diego Marriott Marquis & Marina for your convenience. This is steps away from the Manchester Grand Hyatt San Diego where T&C is being held. You can get directions to the marina from the hotel. We will greet you at the gate. Please arrive at least 30 minutes before our departure time on 12:00pm. The catamaran will NOT wait. What can I expect on the catamaran? A relaxing afternoon of FUN! This is a very casual environment perfect for networking and enjoying San Diego. We recommend swim shorts for the guys and swimsuits with cover ups for the ladies. There is a chance we will stop for a dip in the ocean so feel free to bring a beach bag with a towel as well. Also note it is highly likely you’ll experience the refreshing ocean spray as we sail along. From Aolani: The chances that you will get seasick are slim to none! Many are surprised to hear this, however catamarans are known for their stability! The two hulls are 32 feet apart, giving the base of the boat added stability and designed to slice through waves, rather than bouncing over them like most sailboats, therefor making the experience smooth, stable, and comfortable! We are constantly thanked after the charter for having renewed our guests confidence in boating. What will the food be? It will be healthy, yummy assorted appetizers including vegetarian options. Organic, of course! How can I register so I don’t miss this incredible event? We know you are excited! So are we. Scroll down to the next section. We can’t wait to play on the water with YOU! Register for the METribe Cruise!